COMPUTEX 2014 — TAIPEI, Taiwan — June 2, 2014 — Corsair®, a worldwide leader in high-performance PC hardware, today announced the Hydro Series™ HG10 GPU cooling bracket, a powerful new accessory that gives gamers the opportunity to replace a stock graphics card cooler with any of Corsair's Hydro Series liquid CPU coolers. 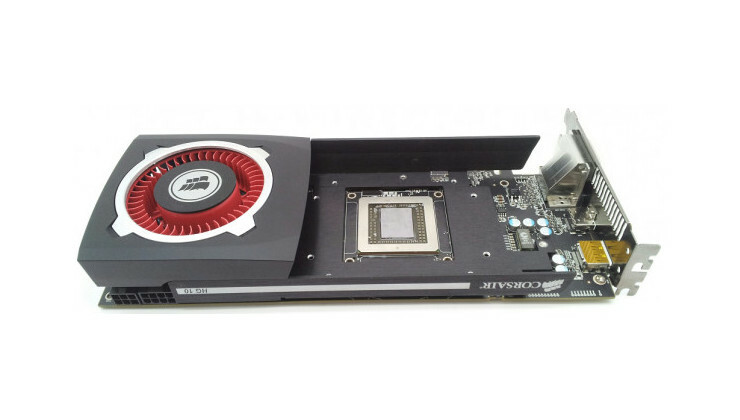 The resulting upgrade unleashes the GPU's hidden graphics performance by reducing GPU temperatures by as much as 50°C (122F), cutting down on droning fan noise, reducing GPU throttling, and boosting overclocking potential. In conjunction with the new HG10, Corsair also premiered new LED-infused versions of its award-winning Air Series™ SP120 and SP140 static pressure fans in five different colors — red, white, blue, green, or purple. The HG10 offers full coverage for compatible reference-design GPUs, meaning it’s not just cooling your GPU itself, but the red-hot VRMs and VRAM on your card. After installing the HG10 GPU bracket, a PC enthusiast can mount any Corsair Hydro Series liquid CPU cooler (available separately) to chill their graphics card’s GPU (up to 50°C) and VRM/VRAM (up to 25°C) lower than stock temperatures. Don’t be afraid to push that overclock and extract every bit of performance from a graphics card — paired with a Hydro Series cooler, the HG10 can quickly dissipate large amounts of heat, and will reduce noise significantly compared to the GPU’s stock fan. The HG10 is a straightforward to install. With only an ordinary screwdriver, you can easily swap your graphics card’s stock cooler with the HG10 bracket — all without the hassle and mess of installing a custom “open loop” liquid cooling setup. The HG10 cleverly re-uses the stock cooler’s radial fan, ensuring consistent airflow over the graphics card’s memory and power circuitry while maintaining compatibility with the GPU’s built-in fan control circuitry. The HG10 is priced at $39.99 and available in several editions designed for specific AMD and NVIDIA graphics cards layouts. The first available edition — due in June — supports the AMD 290x/290 reference cards. Future versions for NVIDIA and other AMD cards arrive later this year. The visually striking Air Series SP120 LED and SP140 LED fans incorporate the award-winning design of Corsair’s SP series fans – a design that utilizes seven ultra-wide, custom-molded blades to deliver higher static pressure for radiators and heat sinks, resulting in superior cooling efficiency. Rubber mounts and highly reliable hydraulic bearings deliver outstanding cooling with exceptionally low vibration, noise, and turbulence. These new LED fans are available in 120mm and 140mm sizes with red, white, blue, green, or purple LED lighting which illuminate the clear-frosted blades with four vivid LEDs.